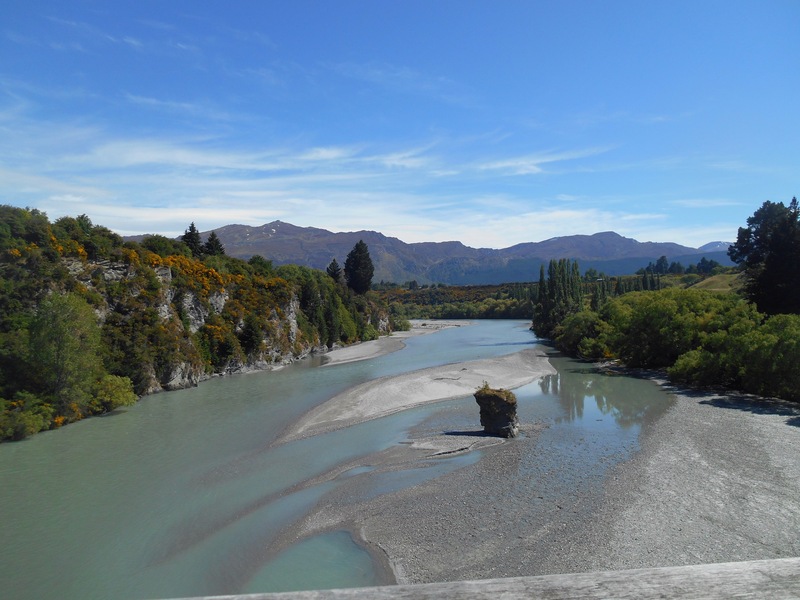 Our cycle continued to follow the river bed, before reaching the Shotover River and the lower Shotover Bridge which looks out on New Zealand’s most gold rich river and the snow field of Coronet Peak. 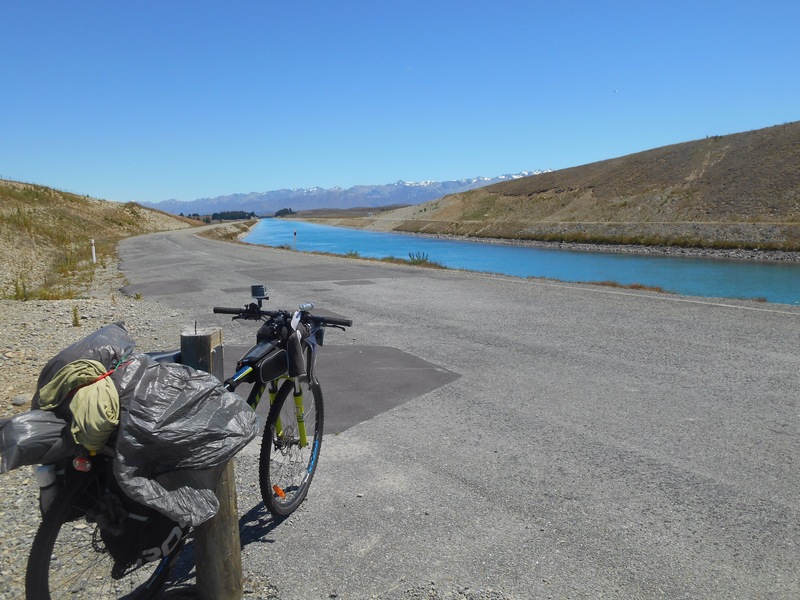 We also put our thighs to the test on an incredibly steep gravel slope which looked out over the Kawarau river, it’s amazing shades of blue sharply contrasted by the banks of greens and oranges. 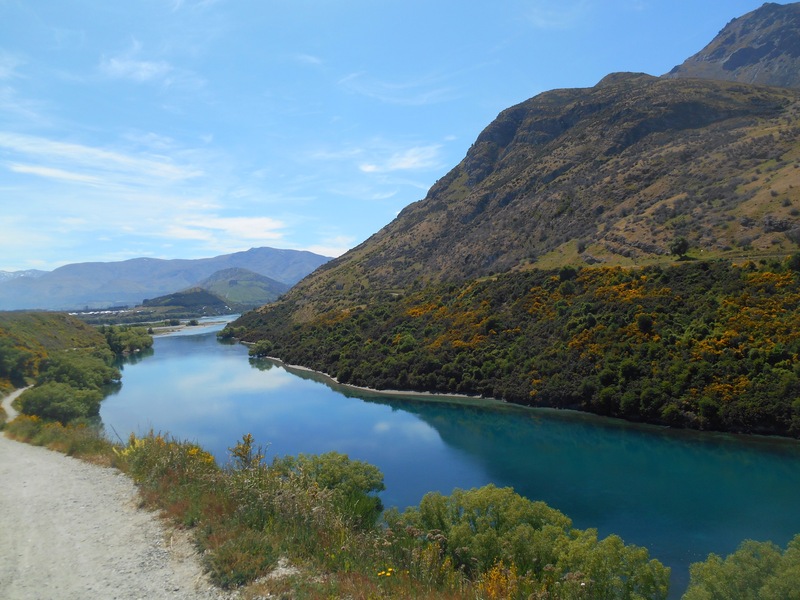 As we descended into Frankton we caught our first glimpses of Lake Wakatipu. Queenstown is famous for the iconic Fergburger which constantly has a queue for people to get their fix. Having enjoyed the Queenstown tourist experience of the queue, we didn’t fancy any of the veggie options and went around the corner for a Devil Burger. Satisfied, we walked through the Queenstown gardens, a peninsula which protrudes the lake, with a beautiful rose garden. The warm afternoon was easily whiled away with a nice cream in the sun before setting up camp on the outskirts of the town. 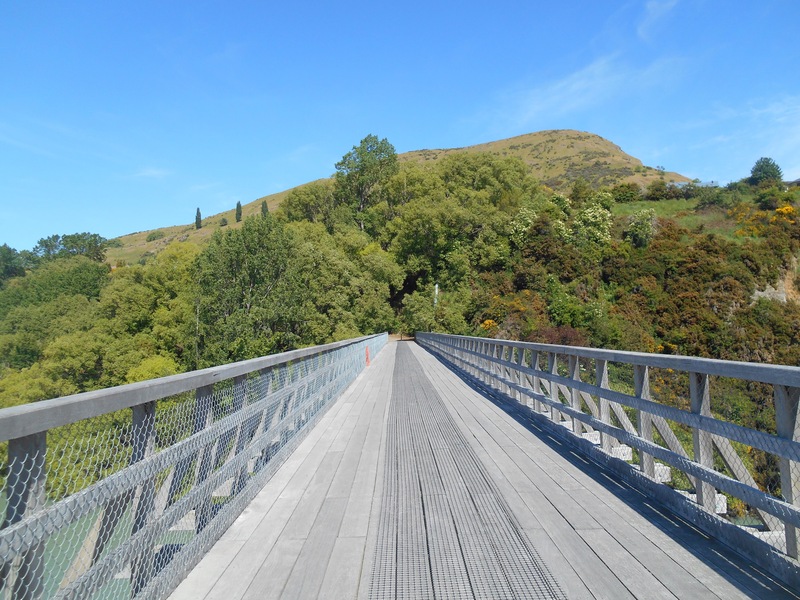 Queenstown, dubbed adventure capital of the world, feels busy at every time of day, a hub of tourists enjoying its beautiful location. With all day to explore the centre we afforded ourselves a lie in. Of course we were still awake at 7am but we dutifully laid in until nearly 8! We enjoyed a slow morning at camp, becoming a photo opportunity for some Indian tourists who found our tent, and us sleeping in it, fascinating. We were also going to tick off one of our aims of the trip, to rent stand up paddle boards. This is the first place where it has been warm enough to fully embrace it (although the water was still 12 degrees.) We took to the lake, Alice much faster than I, and paddled around, dodging ripples from passing boats. Alice even managed a headstand to the great encouragement of passers by on the bank. On the ‘main beach’ we soaked up the sun in an attempt to rectify some seriously dodgy riding tan lines. Alice got herself an op shop outfit so that we could also take part in one of Queenstowns other main activities, drinking. 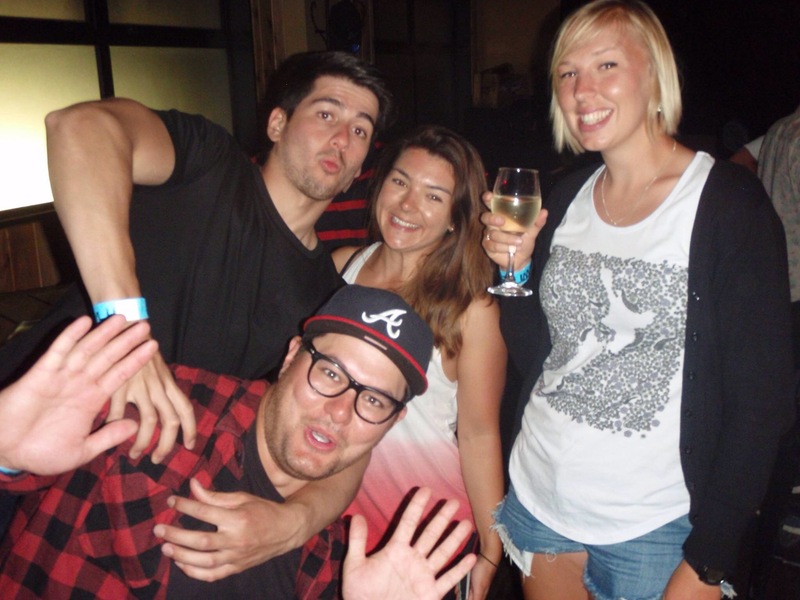 We joined a bar crawl which proved to be rather more intimate than expected at only 12 people, however they were a nice group and we quickly appreciated our small numbers when one of the girls in our group won a bar tab in the limbo competition, before revealing she was a trainee contortionist! 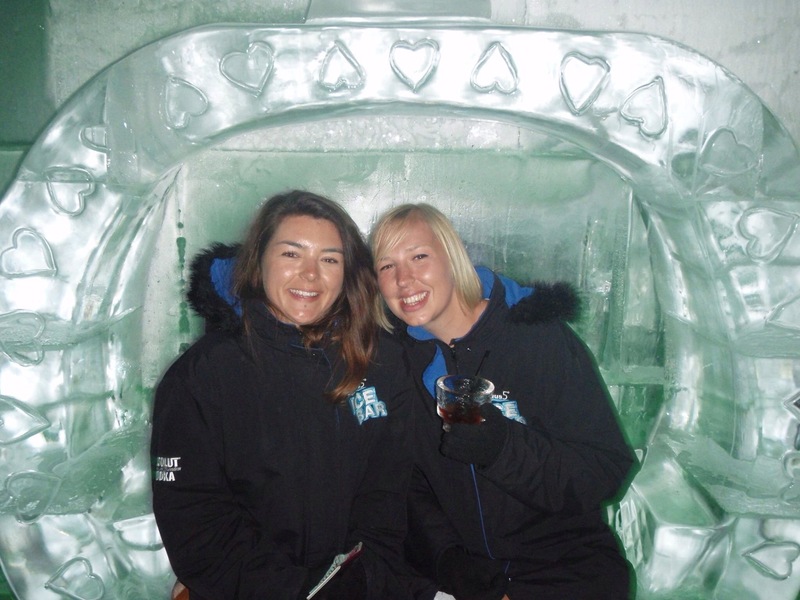 From a bar with a roaring open fire, we went to Queenstown’s ice bar, Minus 5. 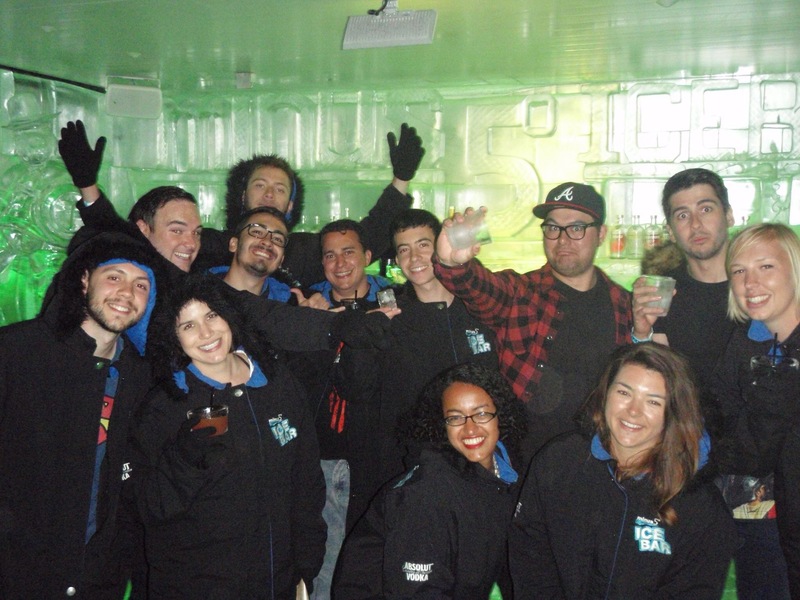 They supplied warm jackets and gloves to enable us to enter the small bar where everything was carved from ice, including the glasses. Having been told you could touch or lick anything you wanted, some of the group took it rather more literally than others and began licking all the sculptures. There was also an ongoing competition to hold a glass with bare hands for the longest time. 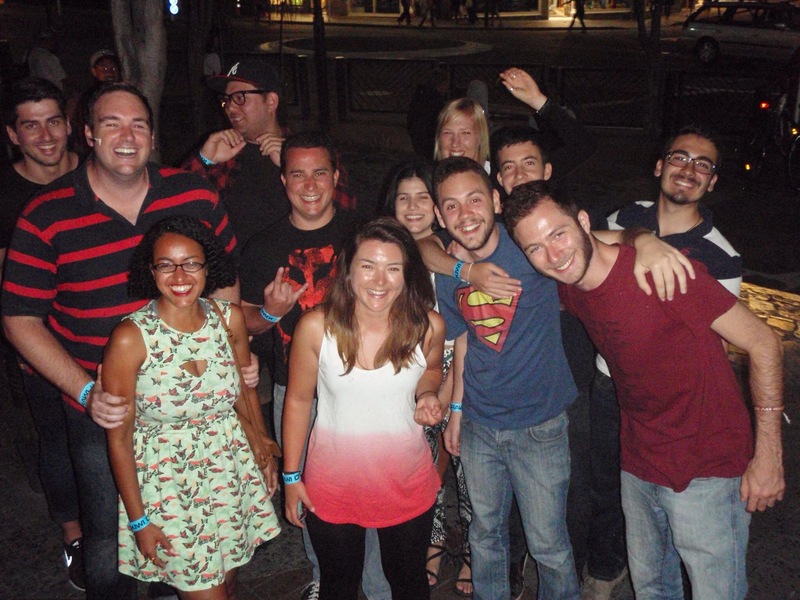 After many bars, we ended up at Fergburger, the popular establishment which even boasts crowds in the middle of the night. The English tourists stood outside were heckling passers by much to our amusement, until we came into the firing line and decided it was time to call it a night. We woke up to drizzle and were pleased we had timed our bus trip to Lake Tekapo perfectly. I managed to snap off the arm of my sunglasses in sympathy to Alice’s. I later discovered sunglasses work fine with only one arm and reduced tan lines only work in my favour. It was a 4 and a half hour drive and by the time we pulled up the skies were clearer. We were now on the east side of the southern alps, ready to start Alps 2 Ocean, our final trail together. The lake is the strongest aquamarine I have ever seen, looking almost unnatural in its natural beauty. We raided the bakery and then set up our tent. We were soon joined by an interesting cyclist who had done bike touring in Spain, India and Alaska so had lots of stories to share. It’s amazing that as soon as you step outside your normal comfort zone, there is people to challenge you to leave it further. We took an evening walk on the lake shore. 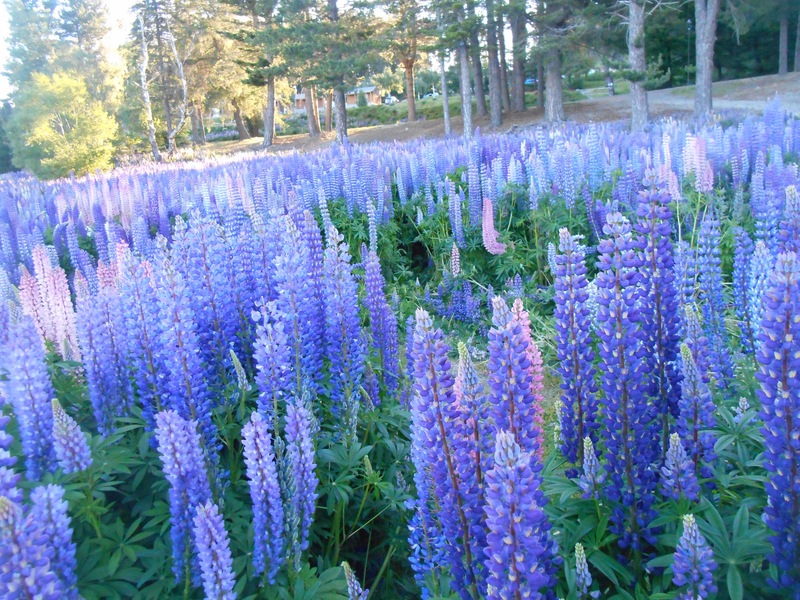 There were forests of foxgloves in vibrant blues and purples. The smell was beautiful and the scene was near perfect. Once packed up we explored Mt John, the mount on the lakeside. We followed the lake path encountering lizards, rabbits and sheep, before climbing to the observatory. 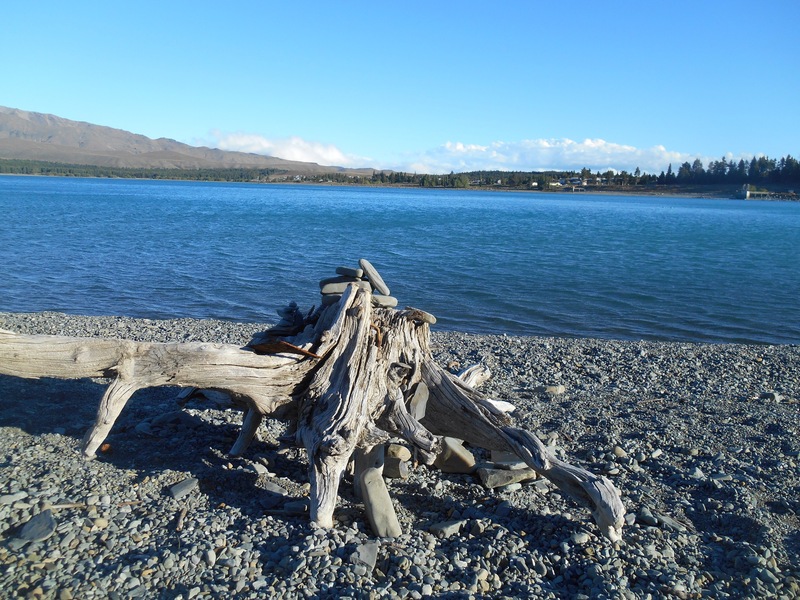 From this angle you had Lake Tekapo’s dazzling blues to one side, Lake Alexandra to the other, and then brown expanse resembling the empty plains of Mongolia. 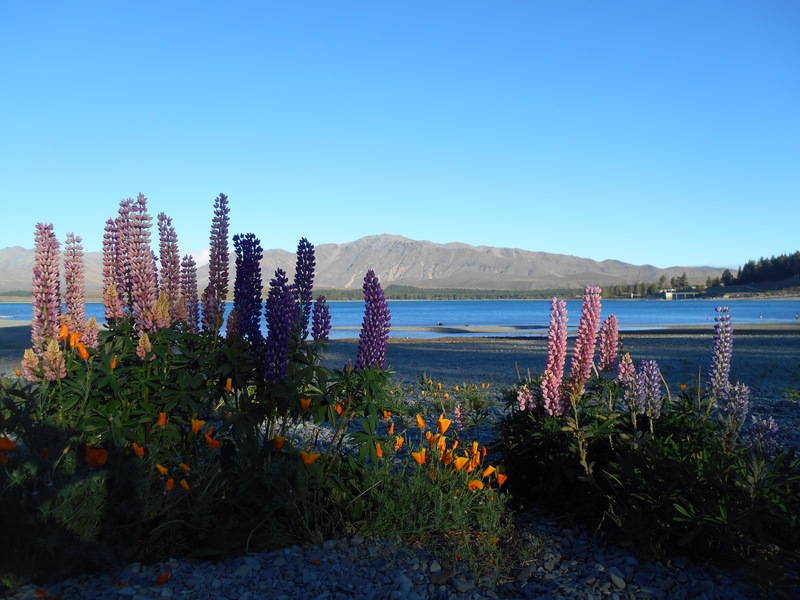 We walked across the rocky hilltop and steeply descended into Tekapo town, the heat of the day on our backs. 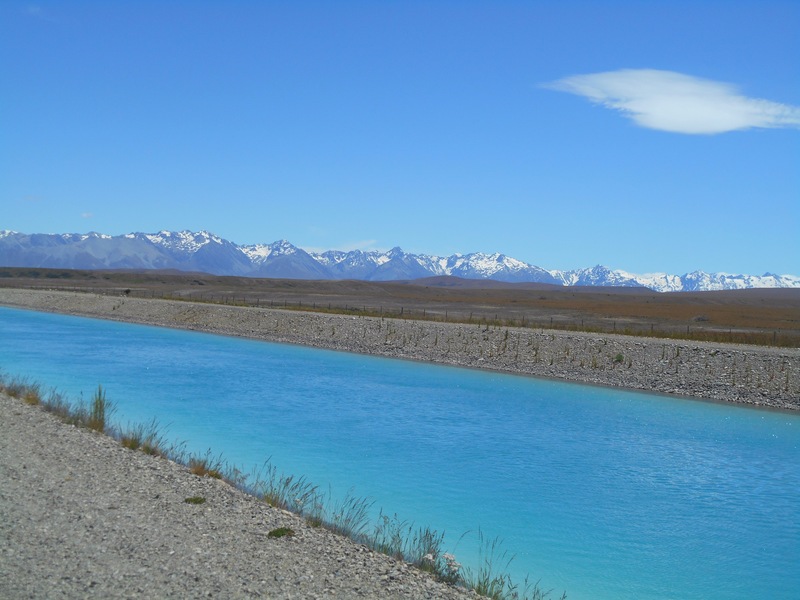 We started our ride about midday and followed the Tekapo canal. The road was empty and filed straight to the hills, the canal the colour of a melted ice pole. We practised our circus act of riding without hands. It suddenly draws attention to the uneven distribution of weight on the back. Late afternoon the road followed to the shore of Lake Pukaki, an incredible expanse bordered with snow capped mountains. We camped amongst the trees, pine cones falling through the brittle branches and littering the forest floor. There was no toilet and the camp was rather full. With little place to hide and the drawn out summer evening, it was a long wait until dark for a nature wee.